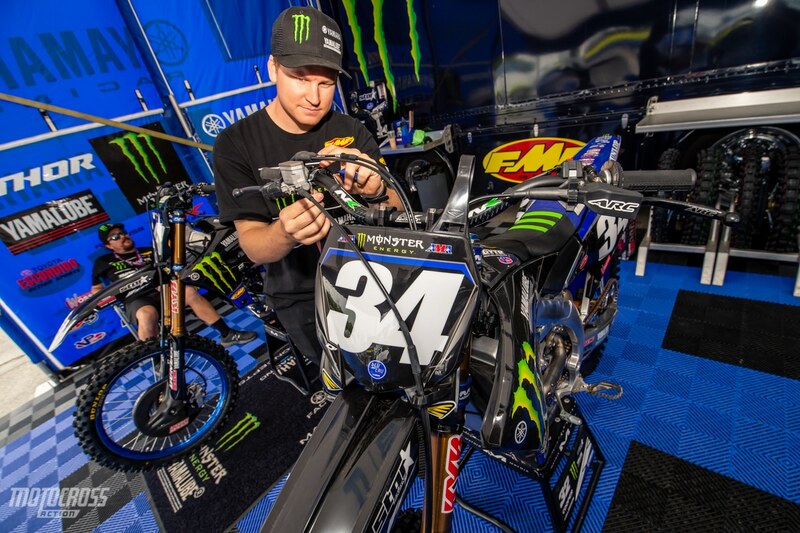 Dylan Ferrandis’ mechanic, Alex Campbell puts the final touches on Dylan’s spare race bike. 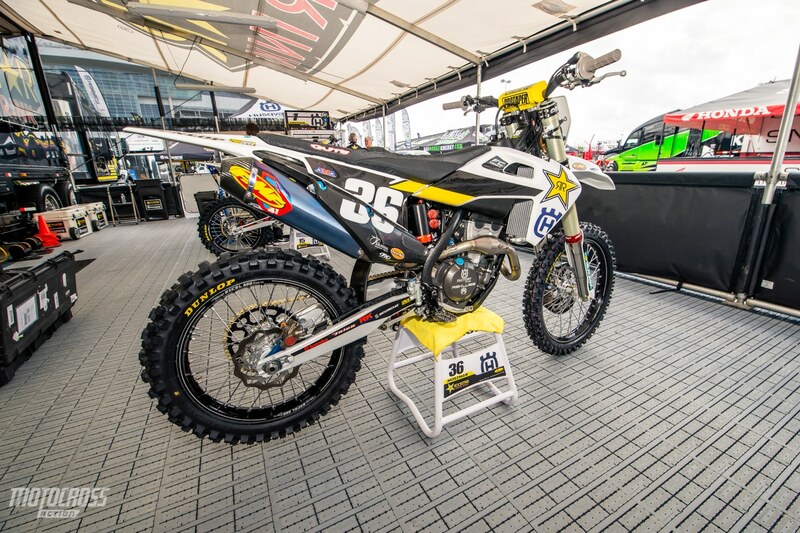 The 2019 Houston Supercross is the third and final Triple Crown event of the season. 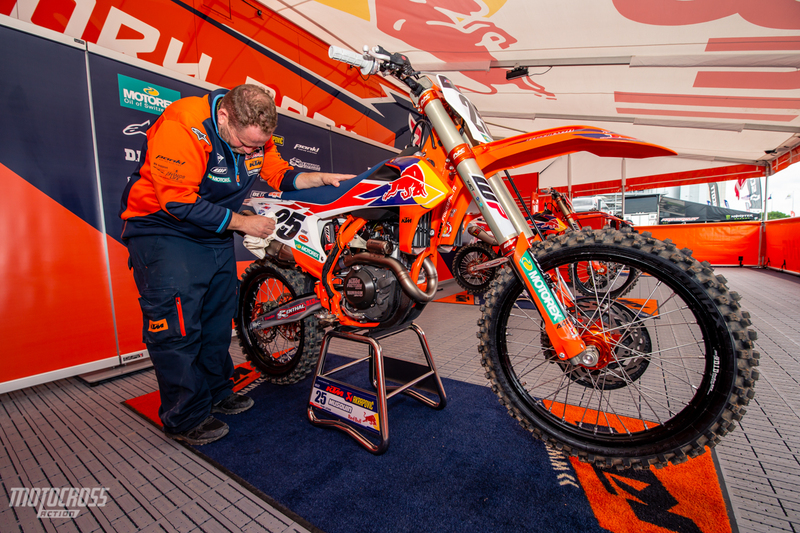 This means that most of the teams and mechanics will be preparing a spare race bike for one last time. On a normal weekend, the AMA only allows one bike per rider to be used. But for the Triple Crown formatted events, they adjusted the rules to allow the riders to have a spare bike, just incase. As you probably already know, instead of Heat races, LCQs and one Main Event, the Triple Crown format consists of three main events, with little time in between. The top 18 riders in the afternoon timed qualifying sessions go straight to the night show and first main event, while the rest compete in an afternoon LCQ to determine who will take the last four spots on the gate. Only 22 riders make it into the night show in each class, and then they compete in three main events to determine the overall winner for the night. 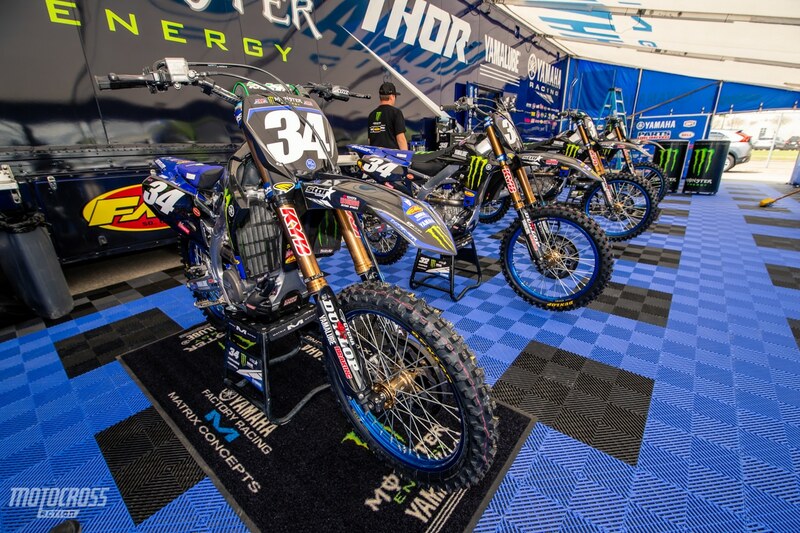 Because each race is a main event, and because there is limited time in between to fix any issues that may occur with the bike, riders are allowed to have a back up. 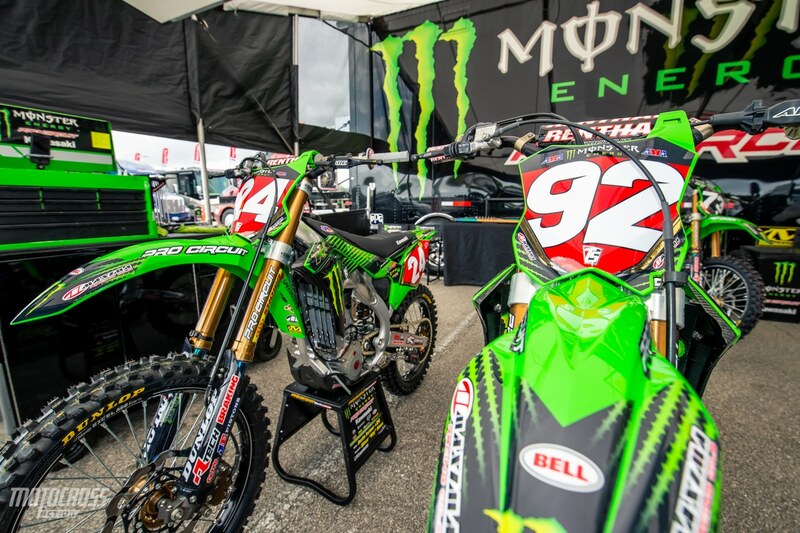 The Monster Energy Kawasaki team gets ready to take both of Eli Tomac’s bikes to tech inspection. The truck drivers and other crew members love the Triple Crown weekends because they get a chance to ride a bike to tech. 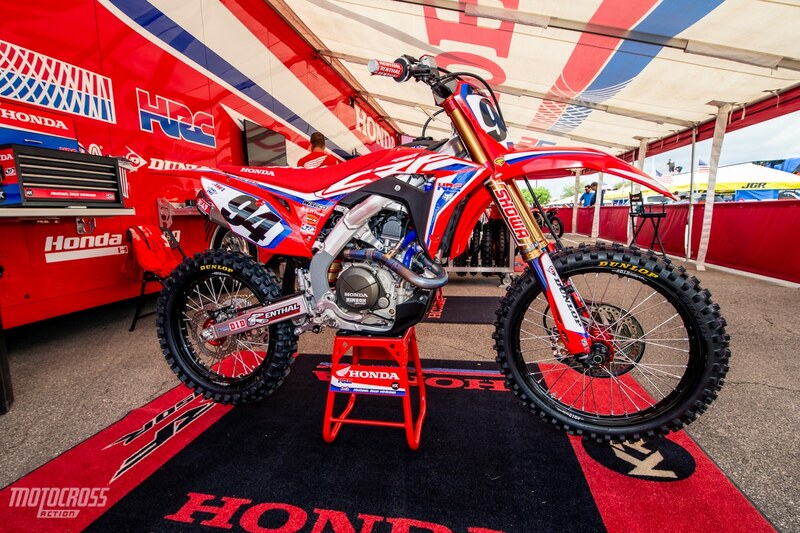 Ken Roczen’s HRC Honda CRF450. 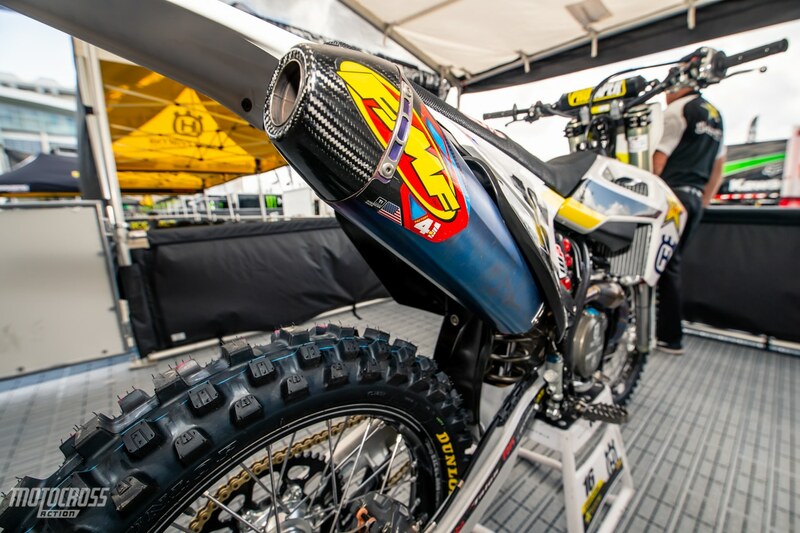 Zach Osborne’s Rockstar Husqvarna FC450 is dialed in with a fresh FMF exhaust. Frankie Latham makes sure that the number 25 is nice and shiny. 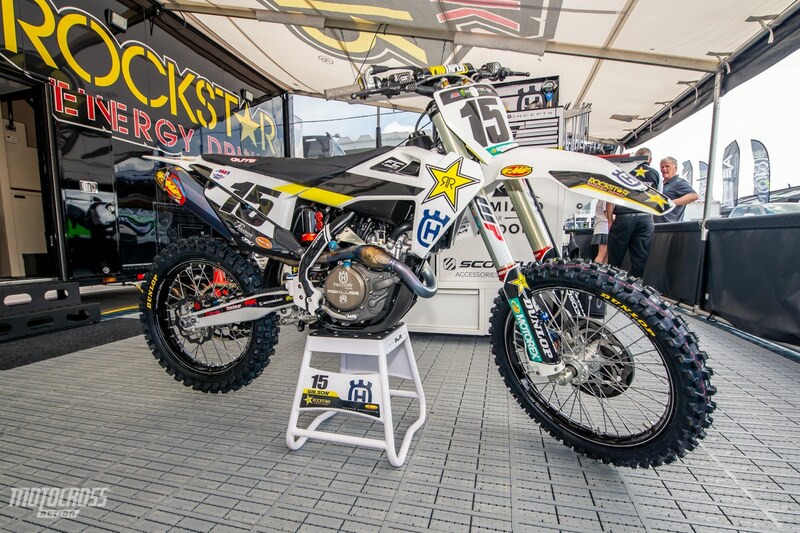 After missing Atlanta and Seattle Supercross due to a wrist injury, Sean Cantrell is back racing again this weekend in Houston. 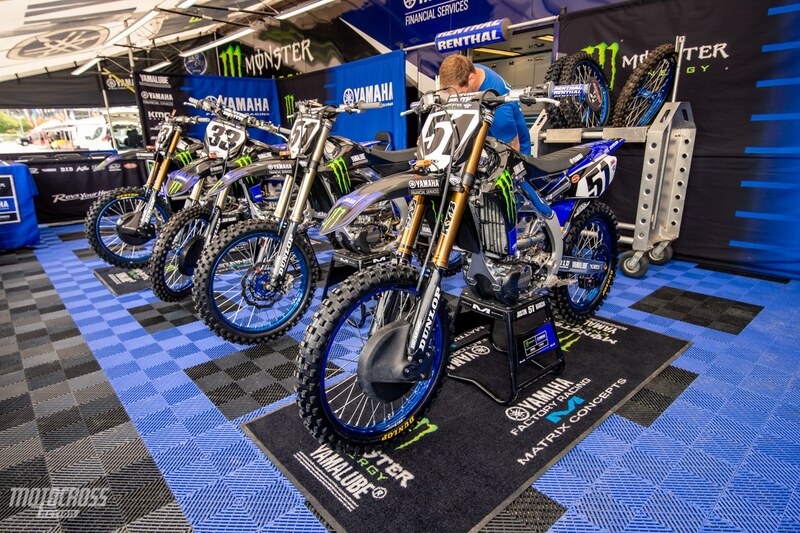 Justin Barcia and Josh Grant’s factory Yamaha bikes are ready to go. 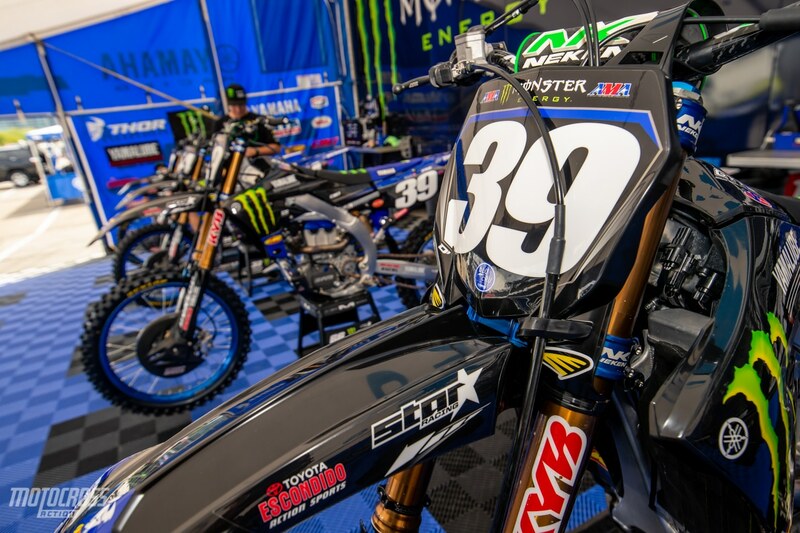 On Friday before the race, the Pro Circuit team put Austin Forkner’s bike next to Adam Cianciarulo’s bike just to remind everyone who’s leading the points in both the 250 East and West Championships. 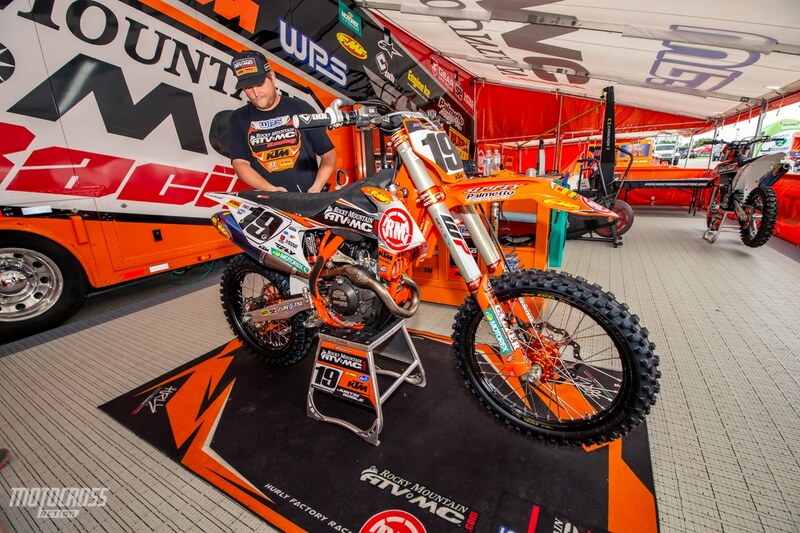 Justin Bogle’s mechanic, Derek Rankin checks over the Rocky Mountain ATV-MC KTM one more time. 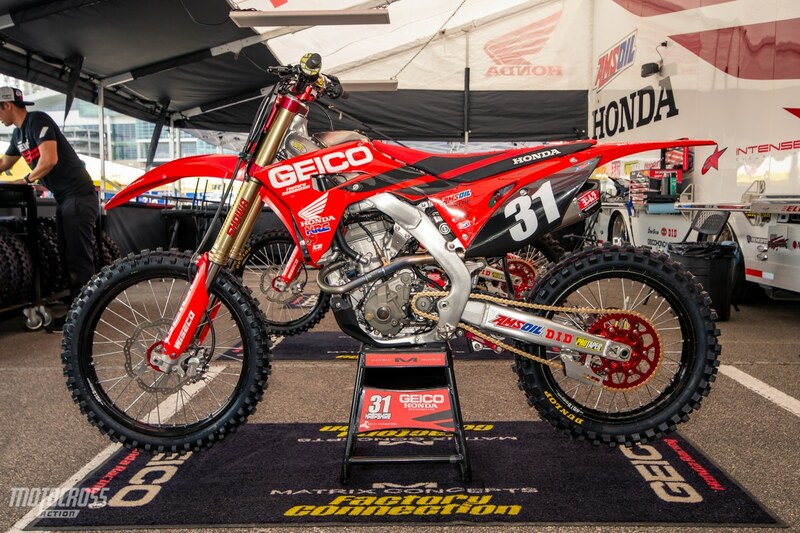 Rj Hampshire’s Geico Honda looks really cool. 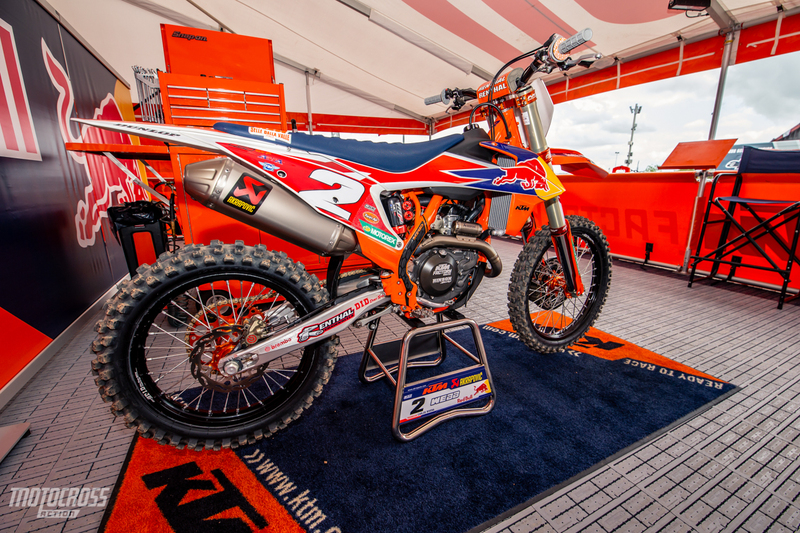 Cooper Webb’s Red Bull KTM is looking clean as always. 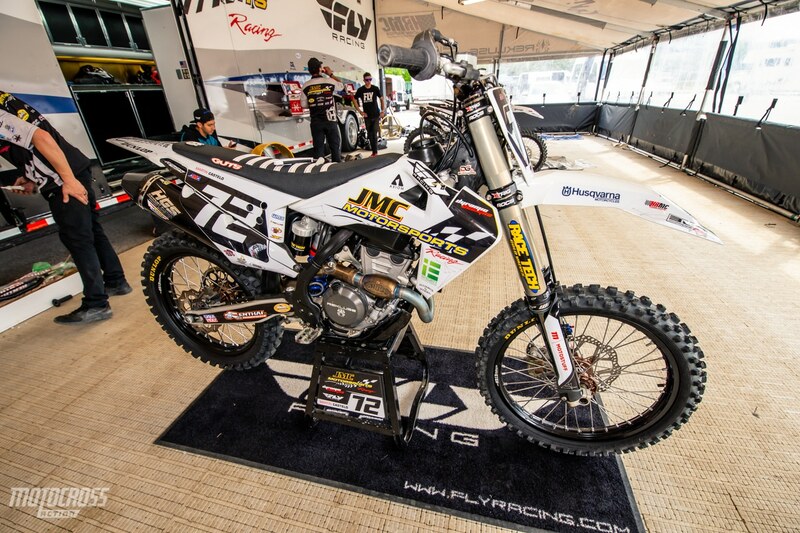 Martin Castelo’s JMC Husqvarna. If you haven’t seen our raw Houston press day video yet, you can check it out here. In the video, Castelo was sitting on the starting line when his transmission clicked into gear and sent Martin flying off the back. This happens occasionally on KTMs and Husqvarnas with factory transmissions. The neutral is hard to reach and sometimes you think you got it, but then it falls back into gear. 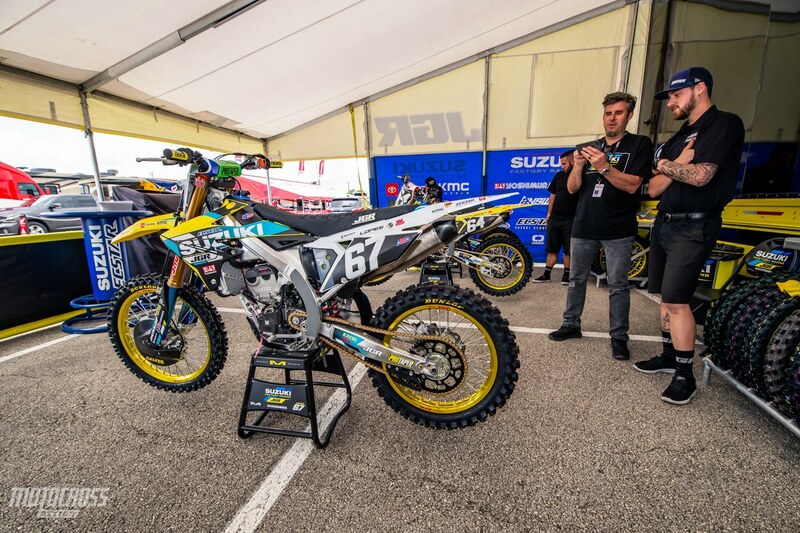 JGR team manager, Jeremy Albrecht and Enzo Lopes mechanic, Wes Hunter are probably laughing at the video we posted on our Instagram about Martin Castelo looping it on the start. 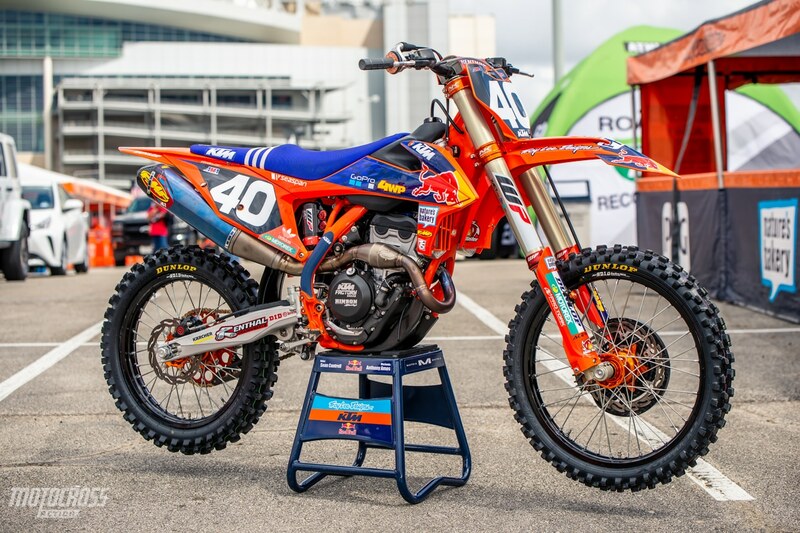 After grabbing his first ever Supercross win in America last weekend, Dylan Ferrandis will surely be riding with even more confidence in Houston. 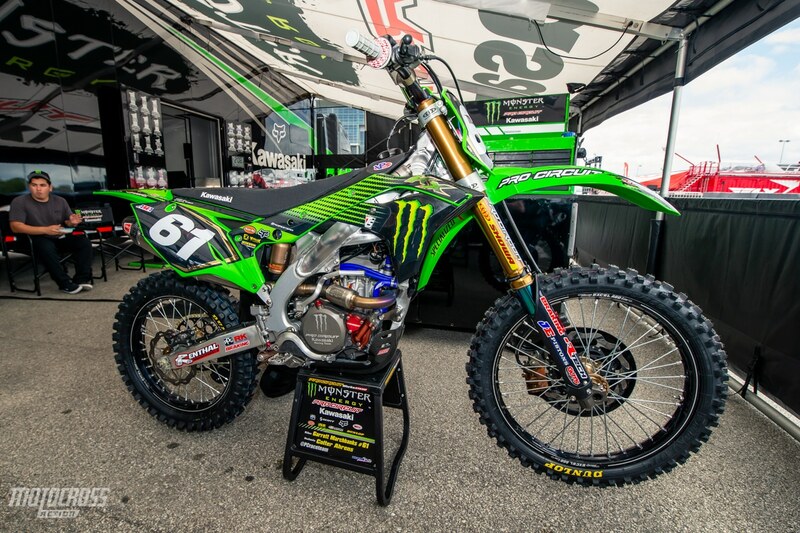 Garrett Marchbanks Monster Energy Pro Circuit Kawasaki. 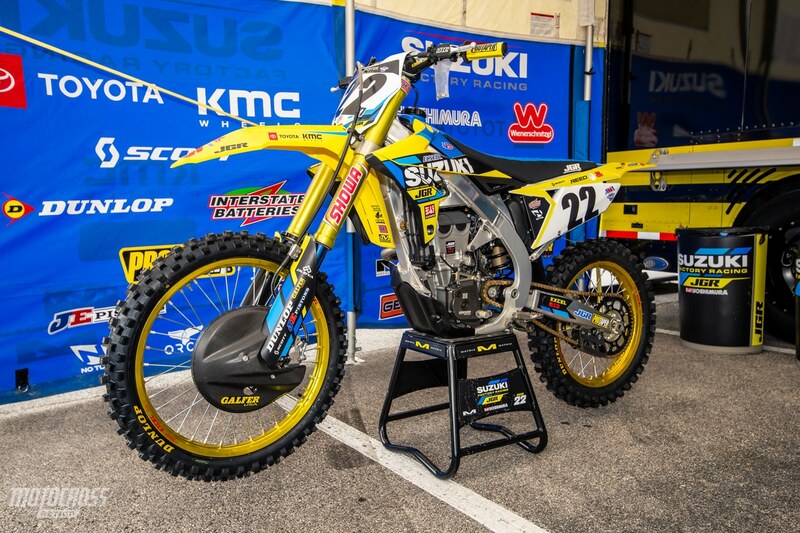 Even though Chad Reed is injured, the JGR Suzuki team still put his bike on display. We’re going to miss Chad this weekend. 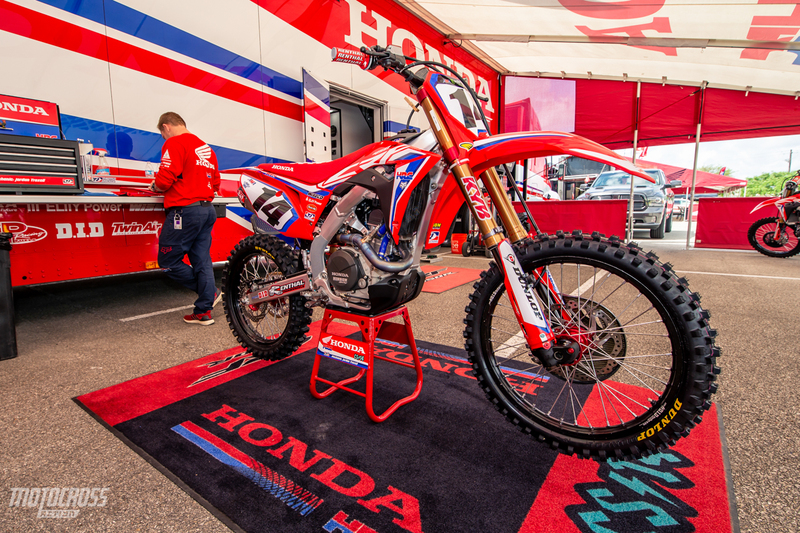 Cole Seely’s HRC Honda CRF450.